In 1833 Martin Charger was born between the present towns of Sturgis and Rapid City in the valley called race track which surround the Black Hills. He died on 27th (16th?) 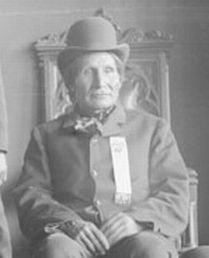 August 1900 at age 59 at the Cheyenne River Agency. Wa-ana-tan, the Charger, who should not be confused with the famous Cut Head chief of the same name, was the son of Turkey Head and Her Good Road, a Sans Arc/Itazipco woman. He had at least one brother, who was called Little Hawk or by his English name John DeSmet Lewis (born 1841/42). His father Turkey Head aka Joseph DeSmet Lewis, who was employed by the American Fur Company as a trader, had been born in 1805 as a halfbreed, the son of a white man called Lewis. Some historians, his brother Joseph and also Chargers own son Samuel had stated that this white man was Meriwether Lewis, the famous explorer, who visited the Sioux villages in 1804. Turkey Head´s mother was said to be a Yankton or Teton woman named Winona aka Ikpsa pe win. Some other historians have said that he instead was the son of a trader called Reuben Lewis. However, as a boy Charger was known by the name of Wowacinye or Dependable. He was told by his father to be always generous to his fellow Lakota tribesmen, which he considered far more important than going to war and earn honor and fame. Nevertheless when he grew older Charger became a warrior in the Itazipco tribe. He went to war against the Crows and joined the Grass Society because of his bravery. 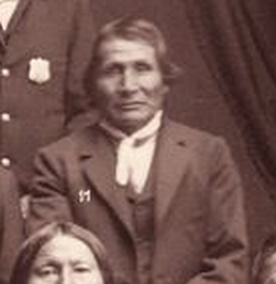 At age 19 he married Walking Hail, a Yankton woman (he later married a second wife called Wasumaniwin or Eliza) and as his family grew he recognized a responsibility for them and he began working for peace between his tribe and traditional enemies. He for example visited and invited the Crows and Arikaras for feasts. At Fort Pierre he led the bands gathered there and talked to others who came there to trade to stay peaceful to the Whites. In 1860 Charger and several other young men founded the Fool Soldier Society, which later played a prominent part in the rescue of the Shetak captives, who were held by Dakotas in 1862. Martin Charger led his “friendly” Siksicela band (see: Kingsley Bray´s post, Sans Arc-thread) of Sans Arc to Fort Bennett and Cheyenne River Agency and started farming. 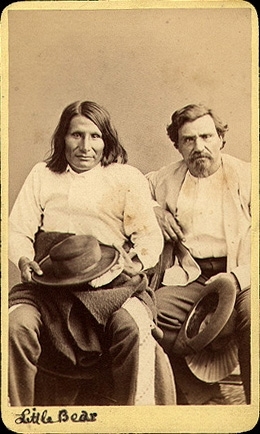 Although he prevented to go to the Fort Laramie treaty councils of 1868 (out of fear of retaliation from present Dakotas for the Shetak rescue) he went to Washington as a delegate in 1870, 1875, 1888 and 1892. In August 1900 he became ill and died. He left behind two sons, Samuel (who later wrote a biography on his father) and Harry Charger, and two daughters, Sophie Left Handed Bear and Jane Grey Bear. Martin Charger (despite the inscription Little Bear) and Bazil Clement aka Basil Claymore, Sr.
As the Lewis and Clark Corps of Discovery left St. Louis in the spring of 1804, written history and oral history would eventually collide. The collision came in the form of questioning whether or not Meriwether Lewis fathered a son with an Indian woman named Ikpsapewin during the expedition. Oral history that has been passed down for generations does name Meriwether Lewis as the father of Turkey Head (AKA Long House; Zomi; Joseph Lewis DeSmet). An old fur trader named Louis LaPlant muddied the waters even more by saying that the father of Turkey Head was Reuben Lewis, a fur trader. Speculation then came up that possibly Lewis’s brother Reuben could have been Turkey Head’s father, but records cannot, at present, be found that place Reuben Lewis in the area at the time of Turkey Head’s birth in 1805. The timing of Turkey Head’s birth coincides with the passing of the expedition, but a story that was passed down through Turkey Head’s family could be why many historians have dismissed the story. 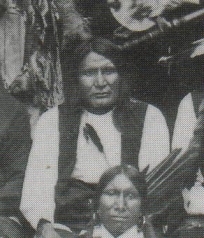 In an interview with Sunshine Magazine in 1923, Samuel Charger, Grandson of Turkey Head told a reporter that when Turkey Head was about 17 years old he took part in a skirmish with members of the Ree Tribe; he made his escape from the fight without counting coup, which would have been considered to be an honor. Shortly after this he returned home and decided to find his father. Charger goes on to say that Turkey Head went down the river with some traders and found his father. His father recognized him as his son and Turkey Head also said he had two half sisters who adored him and wanted him to stay. But since he had been raised among the Indian people he only stayed over the winter and returned home in the spring. This one small story may seem insignificant, but it is the one that has made many dismiss the possibility that Meriwether Lewis could have been Turkey Head’s father. The year Turkey Head went down the river was 1820 and Meriwether Lewis had been dead for over ten years at that time. His brother Reuben had returned to Virginia and wouldn’t marry for another few years, neither brother had any white children. Perhaps Turkey Head did go down river and was recognized by someone other than the Lewis family, perhaps it was the Chouteau family who had been not only the hosts to Meriwether Lewis, but partners in the fur trading business with his brother Reuben. Turkey Head’s tale to his family could have been just to save face after what he had considered to be a dishonorable act in the battle with the Ree. Something definitely happened when Turkey Head traveled down the river within the next decade he would have employment at Fort Pierre Choteau as a trader under the jurisdiction of Jacob Halsey, Bourgeois of the post. He would also within that time frame come into Mary Sarpy’s (White Woman) life as her step-father. By 1833 Turkey Head and Her Good Ground had Wowacinye (later known as Martin Charger, half brother to Mary Sarpy) the first of their four children together. But the union was to be fairly short; by 1850 Her Good Ground had left Turkey Head and married a man named John Split. “She was a fickle woman,” a niece once said of her, when asked about the numerous marriages. But fickle or not, Her Good Ground managed to raise her two daughters by Sarpy and Martin Charger and the other children she had and instill them with strength and pride. 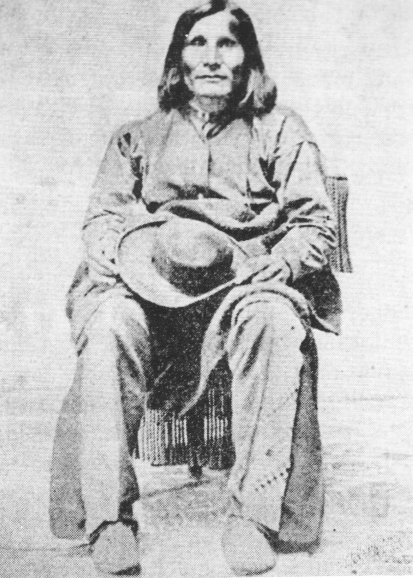 At age 19 he married Walking Hail, a Yankton woman (he later married a second wife called Wasumaniwin or Eliza) and as his family grew he recognized a responsibility for them and he began working for peace between his tribe and traditional enemies. Following Indian custom, Martin Charger had two wives at the time, Walking Hail and Wasumaniwin, or Eliza. To set an example for the others, Martin married Eliza in the Christian church to comply with the laws of the state. (...) If the white man´s law said one wife must be married legally, and only one, Martin did so. Now, is Eliza the second wife? And if so, why didn´t he marry his first wife Walking Hail in church? Mmmh. I assume that probably Walking Hail is Eliza... then who is his second wife? Charger's name is properly pronounced Wa A natan. In Lakotiya, about eighty percent of the time the accent is on the second syllable. Charger is the brother of my two greats grandmother Mary Sarpy aka Wasicu Win which I prefer to translate as American Woman. If Wasicu Tasunke is American Horse then it stands to reason that Wasicu Win is American Woman. Hau, I believe the so-called white man next to Charger is his Metis' brother-in-law Basil Clement (now Claymore). Please change the "White Man" to Bazil Clement or Basil Claymore, Sr. he was Charger's tahanku or brother-in-law having married Mary Sarpy or Sarpee. He was half Indian; his mother Lizelle DuMont was listed as Indian on her wedding certificate (married in 1796) the proof is in the Archive at St. Louis, Missouri. Also, in some of the probate records he was identified as an Indian by those who knew and lived with him from the Siksiliya Itazipco. I modified the post above. Did we already have information on the Siksiliya Itazipco band? Would be interesting to know more. The picture identified as Bazil Clement (Basil Caymore) doesn't resemble pics I have of Old Basil- he was my great-grandfather- but most of what I have seen were later in life. Matotanka, when you say Basil was 1/2 indian, do you mean Lakota or Cree? Are there any other story's about Martin Charger and his Fool Soldiers Society aka Crazy Band. I have this, In Nov. of 1862, this band was envolved in the resque of white captives that were taken from Lake Shitake (Shetek/Shetak) in Minnesota, and were held prisoner by Chief White Lodge. The Fool Soldiers were able to negotiate their release and escape unharmed with the captives. White Lodge and his warriors launching a surprise attack on the band with the intent to take back the captives but failed. Swift Bird (CR-659) was given command of the rear gaurd. His order was to shoot and kill White Lodge at the first sign of hostile intentions. This was the famous Swift Bird (CR-659) known for being a courageous supporter of Martin Charger and his Fool Soldier Society.Members of this band were well known to be respected and also feared. South Dakota historical sites and points of interest 1947 Cheyenne River Agency III,"Home of the Crazy Band who rescued the white captives from the hostiles". Any more help on this?(SDSHC,vol. 22, 1946, p. 11-13, vol. 11, 1922, p. 235, vol. 27, 1954,p.85-87,Oahe Historical site no. 504, 133.7, L-1540&South Dakota State Highway Commission). "Once the Fools Soldiers knew where the Santee were they began organizing. Since they believed in non-violence, they had to be prepared to negotiate the rescue of the captives. They collected extra food and blankets to use for trade as well as coffee and sugar to use for the feast they would need to give the Santee before the bargaining began.11 They traveled north on the east side of the Missouri and after a day they came across Bone Necklace’s Yanktonais camp and were joined by two more young men. As they continued north the group included (Martin) Charger, Kills Game and Comes Back, Four Bear, Mad Bear, Pretty Bear, Sitting Bear, Swift Bird, One Rib, Strikes Fire, Red Dog, Charging Dog, and the two Yanktonais Don’t Know How and Fast Walker." "White Lodge had a change of heart and decided to reclaim his captives. Swift Bird mounted a rear guard action that was mostly bluff and was able to keep everyone safe and moving south." What do we know about the particular members of the Fool Soldiers? Charger and Kills Game and Comes Back were Itazipco. Swift Bear was Two Kettle. Mad Bear was the renown Yanktonais leader, wasn´t he? Anything more? Who is Swift Bear, Two Kettle? Do you mean Swift Bird, Two Kettle? I thought Swift Bird, Two Kettle Sioux was the same as Flying Bird, Two Kettle Sioux (CR-659). The strory by Patti DeCory is great, Thanks.